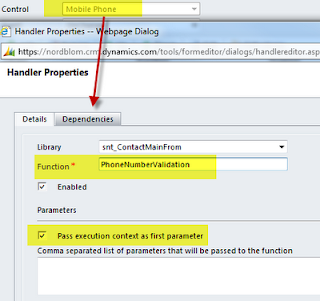 The only difference is that instead of the "phone" and "phoneDesc" parameters being passed into the validation function, the execution context is instead passed in and the phone attribute and its corresponding phoneDesc label are obtained via the context as local variables. The rest stays the same. So that's the theory and I think it demonstrates quite nicely how the execution context can be used. The first is to provide the necessary validation as part of the field on change event as the example above will accomplish quite well. The second is to be called from the on save event to make sure that even if users ignore the message from the on change event they will not be able to save the form via the validation from the on save event (the PhoneNumberValidation function returns a true or false value to indicate whether validation was passed or not). And when the function is called from the on change event the specific field context is not going to be there anyway making it necessary to put in some additional logic in order to handle correctly. 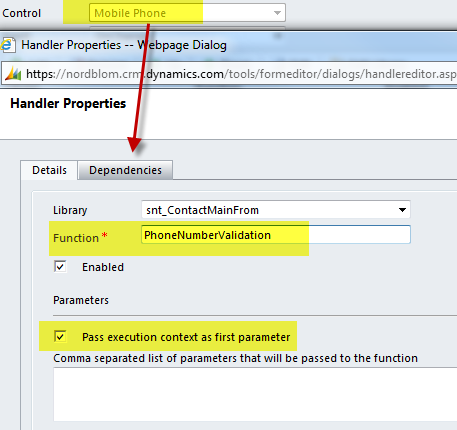 Therefore what you gain from using the execution context in this example is likely to be offset by requirements for special handling required by the on save event.